Khosrow Hassanzadeh, Ya Ali Madadi (01), 2008. Khosrow Hassanzadeh is probably best known for his screenprints of traditional kushti wrestlers, for which he reworks large pieces of thick brown kraft paper, applying bright acrylics with wide brushes. In his recent exhibition at Dubai’s B21 gallery, ‘ready to order,’ Hassanzadeh introduced a new, more sculptural body of work, modeled after the gaudy vernacular of shop windows in downtown Tehran. Beautifully constructed boxes dotted the exhibition, acting as shrine-portraits of family, friends, and iconic figures such as pop singers Javad and Googoosh. The portraits were composed of layered cardboard cutouts surrounded by props, including wooden clubs used by wrestlers for exercise, curtains, flashing lights, beads, wigs, plastic flowers, and a number of other artifacts collected from local bazaars. These items, viewers were led to presume, were odes to the portraits’ subjects, reminiscent of the shrines that dot Iran’s many postrevolutionary cemeteries. The result was a series, titled Ready to Order, of visually overwhelming vitrines, rich in information, that engaged viewers in intricate, life-size narratives. 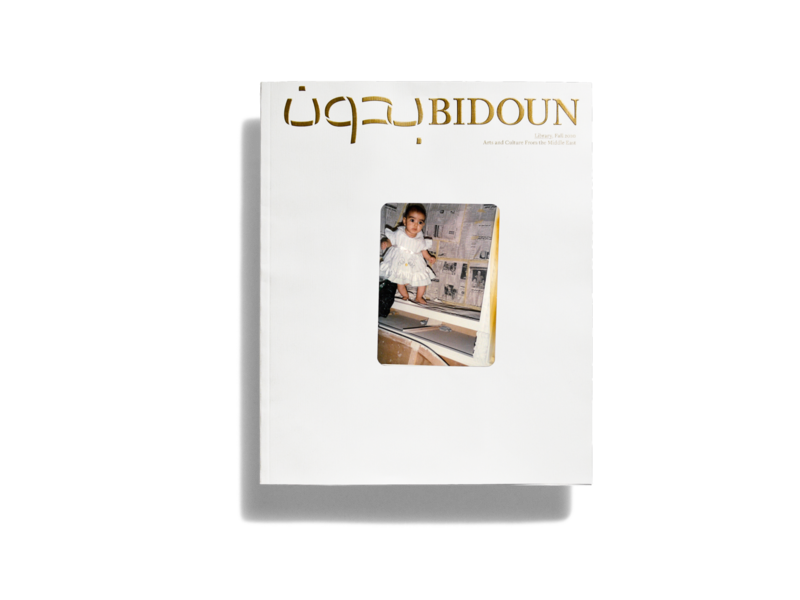 Ready to Order’s concerns bore much in common with previous works by the artist, particularly his Terrorist series, in which he portrayed his mother, sisters, and assorted others with biographical memorabilia referencing their personal and religious beliefs. In that work, ordinary Muslims were presented as potential victims of Western media scrutiny and racial profiling. This recent work may not have aimed to make the same sort of heavy-handed social or political statement as its precursor, but it maintained Hassanzadeh’s concern for “the popular people of Iran,” as stated in the exhibition catalogue. Alongside the storefront portraits was a series of vibrant large-scale paintings on canvas entitled Ya Ali Madadi — the title taken from a Sufi prayer traditionally uttered during nightlong dhikrs, when the pious would call for the support of Ali, the first imam of the Shia faith. The prayer is popular among Pahlavans and other athletes, whose quest for moral and physical strength incorporated Sufi spirituality and meditative techniques. 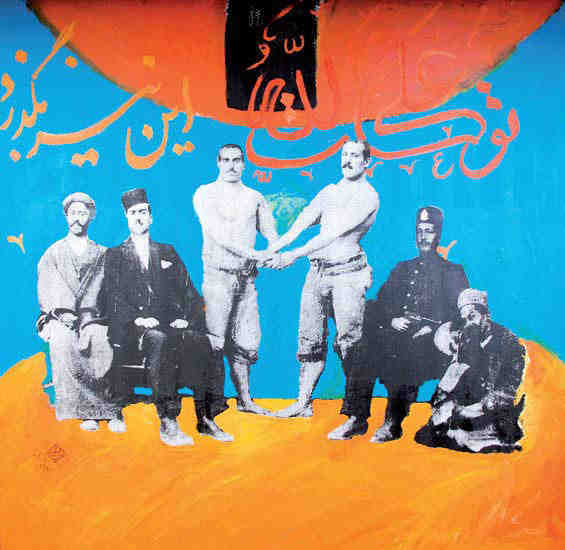 Khosrow Hassanzadeh, A Ali Madadi (11), 2008. 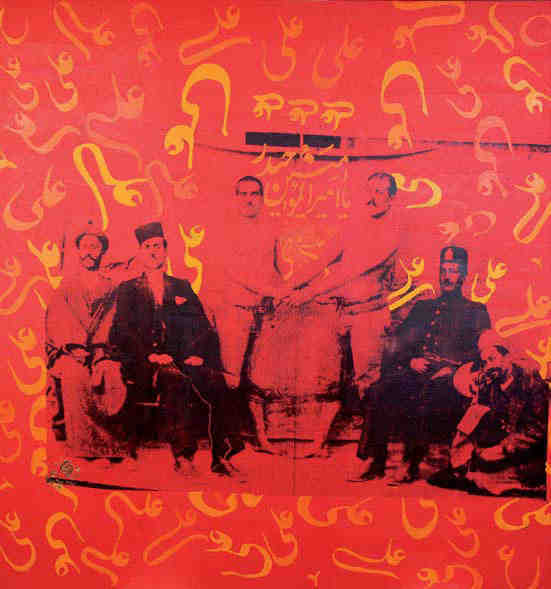 These paintings, a continuation of previous works on brown paper that used the same bank of images, were comprised of monochromatic grainy screenprints applied over highly colored backgrounds, which the artist then overlaid with Ta’aliq-style script of Ali’s name, as well as extracts of religious duas including Tawwakaltu ‘Ala Allah (“I trust in God”). Many of these utterances have taken on superstitious significance and are used as colloquialisms; they can be found painted or applied as stickers on the backs of cars and trucks in just about any country with a Muslim population. Despite these references, the paintings, writ large like the vitrines, didn’t reference popular culture with the same directness as the Ready to Order boxes. The “pop” here was channeled through the language and history of painting: the pieces evoked Warhol’s single-color silkscreen formula. Hassanzadeh’s approach was also somehow strangely reminiscent of Pierre Bonnard’s richly textured candy hues. Bonnard would rarely paint from life, preferring instead to photograph or draw his subject from observation and then color in the drawings at a later stage, a technique we see echoed in Hassanzadeh’s black screenprints later glazed in color. While both the Ready to Order and the Ya Ali Madadi series expressed Hassanzadeh’s mastery of composition and brimming bag of artistic tricks, the link between the two series was more tenuous. The layout of the exhibit, in B21’s admittedly small space, accentuated the lack of synergy between the two, with the vitrines on one side of the gallery, the paintings on the other. This organizational decision, along with that all-too-common tendency of many commercial galleries to want to cram as much work as possible into a single space, detracted from an otherwise engaging experience and the excitement of exploring the new sculptural direction taken by one of the more interesting painters working out of Iran today.